Recent immigration raids resonate painfully for workers who were at a meatpacking plant when agents swept through in 2006. MARSHALLTOWN, Iowa—Her coworkers scattered off the processing line, running into freezers, behind boxes, in between machines, and down into holes where waste and oils from pork remains were dumped. Maria Mendoza turned around quickly from sharpening her knives in the Swift & Co. meatpacking plant. Within seconds, she was alone on the factory floor. Like many others she’d worked next to for 12 years, Mendoza was an undocumented immigrant from Mexico. That day, agents from Immigration and Customs Enforcement came ready to deport them. Mendoza didn’t run. In her mind, she had done nothing wrong. She went to the locker room, changed out of her uniform, hung up her knives, and walked to the cafeteria where workers were gathered—by choice or by force—for interrogations that would last hours. Then they waited. Agents asked each one, “What’s your name? What’s your real name? What name are you using right now?” The Department of Homeland Security said some of the plant’s 2,200 employees were using stolen Social Security numbers and names of legal residents and citizens to get jobs. As agents led nearly 100 undocumented immigrants, many still covered in pork blood, into three buses, Mendoza saw her brother, who also worked at the plant, cuffed at both his hands and feet, being dragged onto a different bus. He had tried to run earlier. In the distance, a large crowd gathered with signs and chanted Si se puede! The sight brought her to tears. The raid on Dec. 12, 2006 was one of six at Swift plants around the country that day. Almost 1,300 undocumented immigrants were detained nationwide. Ten years later, the scar left by the raid remains in this town of 28,000, an hour northeast of Des Moines. Rumors are spreading around a run-down dance hall in Marshalltown where local union members are meeting on a Sunday morning in January. It’s single digits outside and the heat is barely on. Everyone keeps their coats on as they debate who will represent them to negotiate with the meatpacking plant about bathroom breaks, safer speed on their lines, and health care. Some people say they think they saw ICE agents in town earlier in the week, and warn others not to answer their doors for anyone. “Maybe it was a disguise,” says the other man. Some women huddled in a group say people fearing an ICE raid aren’t showing up to ESL classes in Hampton, a small town over an hour north that’s 22 percent Latino. Word of new raids in Georgia, North Carolina, and Texas leaves an unsettled feeling in these workers from the same meatpacking plant that was raided a decade earlier. After two hours of debating plant conditions, one man stands up. “I’ve been working here for 18 years,” he says. “Conditions got worse after ICE came.” Rumbles of agreement flow through the room. Fernando Guevara understands why everyone is nervous. He’s nervous too. “Especially now that there’s word about raids, people are again really tense and scared and worried,” he tells me just outside the union meeting. Guevara had just gotten into work the morning of the raid when he saw ICE agents flooding the hallways. He says he overheard one agent say to another, with a laugh, “Let the hunting begin.” The agent then spotted Guevara. “Here’s one of them,” the agent said, he remembers. Guevara had been a citizen since 1987. He waited in the cafeteria for over an hour with his coworkers. When agents finally got to him, Guevara showed them his driver’s license. Agents, he says, called him a liar. He says the confrontation was interrupted by the screams of a woman who was being dragged away by her hair. He wasn’t detained that day but his sister-in-law’s husband, Juan Avalos, was. The arrest would start a chain of events that split up the family for years. Avalos was deported to Mexico a few days later, but he made his way back to Marshalltown in little over a month. ICE hadn’t left the town and was still searching for undocumented immigrants, including him and his wife. Soon after Avalos returned to Marshalltown, ICE agents looking for him showed up at his house, and later Guevara’s house. His wife was home, but they didn’t have an arrest warrant for her. Guevara’s daughter, Veronica, got a frantic phone call from her aunt, Elizabeth, saying ICE was at her house. When she arrived, three agents were questioning her aunt. Only 14 at the time, Veronica Guevara told the agents, “You guys need to leave and come back with a warrant.” They heeded her warning, giving the family enough time to burn documents and hide Elizabeth Avalos and her two children with a friend of a friend until they could contact a lawyer. But the lawyer’s advice was not what they expected. A year later—after her husband was moved from detention centers in Kansas to Oklahoma to California and then deported to Mexico—the lawyer told Elizabeth Avalos to turn herself in for a six-month stay in a detention center, promising she would be released with a work permit. In theory, it sounded good to the family. So, the Guevaras took in the American-born Avalos children, who were 4 and 6 at the time, as she was moved to detention centers in Massachusetts and later Connecticut. The detention stay lasted eight months, after which she was deported. The $10,000 they paid the lawyer was a waste. Fernando Guevara soon put his sister-in-law’s children in the car, took two days off work, and drove them to Central Mexico to reunite them with their parents. Six years later, they are still there. The family is trying to figure out if the children should move back to the United States. The oldest child is 13 and needs to live in Iowa for five consecutive years to qualify for in-state college tuition. He’d have to strengthen his English, which would be the least of his difficulties. The family would have to separate once again. Many other families were deported after the raids. Some tried to navigate immigration courts for a second chance. A decade ago, Maria Gonzalez got to the meatpacking plant just as agents loaded undocumented immigrants into buses. As people around her cried and yelled, she scanned for her mother, Maria Mendoza. She thought she saw her in the lines of handcuffed workers being pushed by agents, but couldn’t be sure. “It broke my heart to know that she was somewhere in there,” she says, as streams of tears and mascara mark her face. Her mother worked the first shift at the plant, so she usually got her siblings to school. Before they left that morning, a neighbor called to say Immigration was at the plant. That night, she and her siblings sat on their mother’s bed looking at each other with no idea what to do. They didn’t know where she was. This wasn’t the first immigration raid at the Marshalltown meatpacking plant, one of dozens of plants nationwide that were targeted for their large immigrant workforce, according to a report by the American Immigration Council. In 1996, the Immigration and Naturalization Service had raided the same plant, detaining 148 undocumented immigrants. Rafael Bedolla was on the first shift when the plant was raided, the same shift during which the 2006 raid would occur. He worked on the pig-neck section of the line, deboning hogs. After bumping into an immigration agent in the bathroom, he peered outside to see three buses and police cars. “Hey, Immigration is outside,” he remembers yelling to the other men on his line, who started running and hiding in the same degrading places workers would use 10 years later. The parallels between the two raids were striking, not only in how the raids happened, but their effect on Marshalltown, as well. 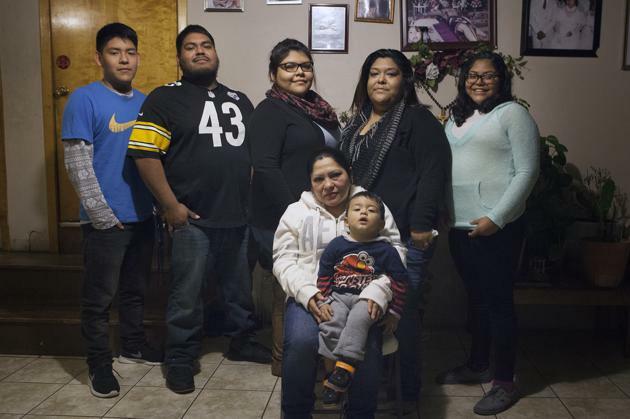 The raids showed how dependent the small town’s economy was on immigrant workers. Before the plant started busing in Latinos to work there in the late 1980s, there were only about 300 Latinos in Marshalltown. There were over 3,000 by 2000, according to Census figures, making up 13 percent of the population. Beyond the $500,000 the company lost in production in Marshalltown in 2006, and $50 million nationwide, according to Swift estimates, many Latino immigrants left following both raids, depleting major parts of the workforce, says Joa LaVille, founder of local activist group Immigrant Allies. Fear in the Latino population led to a decrease in patronage at local stores and restaurants in the immediate aftermath of the raid, according to the American Immigration Council report. The same study shows that homes owned by Latinos in the city lost a third of their value, as a dozen were foreclosed, most as a result of the raid. Statewide retail sales declined 3.2 percent in that quarter in 2006 from the previous year, which the report also ties to the raid. Similar effects happened in communities in Colorado, Minnesota, Nebraska, Texas, and Utah affected by the 2006 raids in Swift meatpacking plants. But most of all for Bedolla, he worried about the children left after immigration officials detained their parents. After the 2006 raid, he went to St. Mary’s Catholic Church, where community organizations were bringing children who had been left alone, following a door-to-door search. Following the latest raid, the 1-800 number the plant provided to families of detained workers wasn’t working and ICE was unwilling to release the names of those detained at the time. Gonzalez didn’t know where her mother was. Soon after, however, she got a phone call from a friend of the family. “I’m going to get you guys a lawyer,” she remembers him saying. Michael Said, a Des Moines-based immigration lawyer, arrived at 11 that night at Camp Dodge, a National Guard base in Johnston an hour southeast of the plant, where they were holding many of the detained workers. Just before he arrived, agents had handed Mendoza a document. If she signed it, she would deport herself immediately. Most people that day signed their own deportations. The agent said that if she didn’t sign the paper and deport herself, she could serve a 10-year sentence in a detention facility. Said walked in. “You’re leaving with us,” he told her. When she finally got home, her children were ecstatic. But no one knew where Mendoza’s brother was, making the night bittersweet. Two days later, Gonzalez’s younger sister, Karina Mendoza Alvarez, went to the local library. She heard her uncle was pictured on the front page of The Des Moines Register being boarded onto an airplane for deportation. That’s where she met LaVille, who found her uncle in the newspaper, his arms bound in front of him as he was led to an airplane. In the months that followed, Mendoza went to countless immigration hearings and remained out of work. The family had to get food through donations and friends. The children were emotionally exhausted. For the last immigration hearing, the judge asked for letters from the community speaking to Mendoza’s character, stating that she was a good citizen. They went to churches, organizations, schools, and the plant, collecting 150 notarized letters and delivering them to the judge. In addition, the judge asked that three U.S. citizens speak on her behalf. And after five hours of the hearing, the judge asked Alvarez to say why her mother deserved to stay. It all worked. The court granted her 10 years of residency, after which she could apply for citizenship. Today, she’s learning how to speak English fluently to complete the citizenship application. She wants to vote. Gonzalez and her brother Diego were too old to qualify for residency under the court decision. They both had to apply for Deferred Action for Childhood Arrivals, which President Obama created in 2012 through executive action. Mendoza is back at the meatpacking plant. Maria Gonzalez is now a bilingual teacher for low-income families, one of the many “extraordinary leaders” who emerged from the raids, says LaVille. But the raids were devastating to the community. While the town has tried to accommodate its Latino population by creating bilingual programs and community initiatives, tensions remain between those workers and the plant. They still haven’t forgotten.